A man off the street has his feet washed at First UMC, Miami, during the church's annual foot-washing and shoe giveaway event. Photo by Steve Wilkinson. MIAMI – The annual tradition of washing the feet of the homeless at First UMC, Miami, is grounded in the story of Jesus bathing the feet of his disciples. But it got its start much later – in the early 1990s, when a homeless, barefoot woman was electrocuted in a rainstorm. If she'd just had rubber-soled shoes, it wouldn't have happened, said Dr. Bill Barnes, then pastor of the church in downtown Miami. "We hosted the funeral for this person," recalled Barnes, now pastor of St. Luke's UMC, Orlando. "She was a Jane Doe." He couldn't shake the thought of how shoes could have kept her alive, and he couldn't help noticing the many homeless going barefoot in the parks and shelters around the church.He got the idea of combining a foot-washing and shoe giveaway during Holy Week. One by one, he broached the idea to the mission committee, church council and eventually the entire congregation. The shoe giveaway was a hit; the foot-washing part, not so much. Finally, "we decided we could be humble enough to do it," Barnes said. Hundreds of homeless people got their feet washed and outfitted with new socks and shoes the first year. "The best thing that happened is we had them [volunteers] kneel in front of them to do it, and you naturally engage in conversation," Barnes said. "That's the wonderful thing." Grace Church will hold its third annual foot-washing and back-to-school shoe giveaway July 27 at its Cape Coral campus and Aug. 3 at Fort Myers Shores. 2011 photo from Grace Church. Twenty-two years later, the Miami congregation, under the leadership of Dr. Cynthia Weems, is still finding that to be true. First Miami has carried on the ministry, and 345 people were served on Saturday. On the west side of Florida, another congregation recently began a similar ministry, but focusing on kids at back-to-school time. Last year, Grace Church, Cape Coral, washed feet and prayed over 500 youngsters and their family members before sending them home with new shoes and school supplies, said Heather Evans, Age Level Ministries director at the church. And in the Panhandle, worshipers at Parker UMC, Panama City, part of the Alabama-West Florida Conference, added foot-washing to their Ash Wednesday service for the first time in 15 years. "It was not about washing the dirt off of someone else's feet," said Rev. Gary Stringfellow, pastor at the church. "It was a sign of humility." The neighborhood around First Miami has gone more upscale since foot-washing began, but there are still plenty of homeless who seek assistance at the church, said Weems and Mary Weden, who oversees the homeless ministry there.The ministry includes a foot check by Barry University podiatry students and faculty. This year, 27 budding podiatrists set up examination stations in the church fellowship hall as part of the foot-washing program. 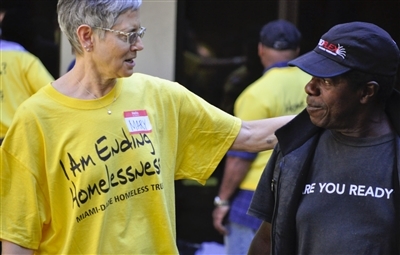 Above: Mary Weden, who oversees the homeless ministry for First UMC, Miami, talks with a man who came seeking shoes at the church's 22nd annual foot-washing event. Below: Dr. Cynthia Weems, First Miami pastor, chats with a recipient as she washes his feet. Photos by Steve Wilkinson. About 200 people call First Miami their church home. Joining volunteers from First Miami were people from Korean UMC of South Florida, the Wesley Foundation of Florida International University and Miami-Dade College, and local Catholic, Episcopal and Christian churches. About 120 volunteers bathed feet, distributed shoes and socks and served meals in the church courtyard. Among the volunteers was Orlando de la Rosa, who recently moved into a small room without electricity after living on the streets for nearly 30 years. He told Weems, "I wanted to come today not to receive but to give. I wear my 'volunteer' label with pride. I've made it to the other side." Recipients included Clyde, homeless in Miami for three years. He told a volunteer he hasn't abandoned his dream of attending a university someday, and First Miami's ministry gives him hope. "With this pair of shoes begins a new day: new shoes, new life," the man said. Weems was among those washing feet. She said she was struck that the ministry was a humbling experience not only for those washing but those being bathed. "They would say, 'Why are you doing this?'" Weems said. "We'd say, 'We are doing this today because we love you and God loves you. This is the way we show love.'" Although the year-round homeless ministry at First Miami has seen more women in the last two years, most of the people who stood in line Saturday waiting for shoes were homeless men, Weden said. "They are not different from you or I," she said. "They have run into some bad luck or twist of fate. … Most of them are really trying to leave the streets and make it on their own." Weden credits God for shepherding the ministry through the years. "It's richly blessed," she said. "It just makes me cry, it's so amazing." The idea of combining foot-washing with a shoe giveaway at Grace stemmed from a 2010 mission trip to Kentucky, recalled Heather Evans. Middle- and high school students went on the trip and participated in a foot-washing ministry. The following year, the church collected enough back-to-school supplies and shoes to outfit about 250 kids. It wasn't hard to persuade churchgoers to give, and some community organizations and merchants chipped in or offered deep discounts. "It really captures their hearts," Evans said. "I think everybody can relate to kids going back to school and needing to feel they have everything to be successful." More than two dozen podiatry students and faculty from Barry University near Miami checked the feet of the homeless for blisters and bunions at First UMC's annual foot-washing event. Photo by Steve Wilkinson. Last year, the number of recipients about doubled. The event included a family festival with face-painting, free haircuts, vision screenings, fingerprinting and food. It took about 200 volunteers to stage the event, with most of them coming from Grace, a church of more than 2,000.Those who washed feet took advantage of the experience to talk about Jesus. "That's one of our main objectives," Evans said. "When we advertise it, we say we will have a message of Jesus. … We pray over every family before they leave." Some people who show up for the shoes return to church for spiritual sustenance. Evans remembered a woman with children who came to Sunday worship the day after last year's event. "She just grabbed my hand and said she had to come back because the love she and her kids experienced that day was overwhelming to her." This year, Grace is expecting an even bigger crowd and will stage the event at two locations – the Cape Coral campus on July 27 and Fort Myers Shores campus on Aug. 3. At Parker UMC, Pastor Stringfellow said he had been reading the Bible account of Jesus washing the feet of his disciples at the Last Supper when he decided to add it to the congregation's Ash Wednesday service. Washing someone else's feet and allowing one's feet to be washed both require humility, he said, and he thought it would be a fitting part of a service where worshipers typically reflect on their sins and express remorse. He said he had encouraged foot-washing at other churches over the years, though not as an Ash Wednesday observance. "I did not have any training in seminary to do this," he said but added that the experience tends to draw deep spiritual responses from people. He encouraged people to wash the feet of someone they looked up to or perhaps had ill feelings toward. Though many were surprised when the bowls of water came out, about 50 of the 60 people attending complied, Stringfellow said. "I think there was some healing of relationships between people," he said. "It does something for the person doing the washing and the person receiving the washing," Stringfellow added. "I don't think there was a dry eye in the service."